Joy. Happiness. Love. Passion. Success. Fulfillment. What fuels your life with meaning at the deepest level? We all want to achieve our vision of an extraordinary life, but most simply don’t know how or where to begin. Many lack the strategies, tools and inner strength to make lasting change and may even have limiting beliefs and obstacles holding them back. The Ultimate Edge can help you in discovering the strength inside you to break through barriers and create massive results. Why do certain people succeed when others fail? 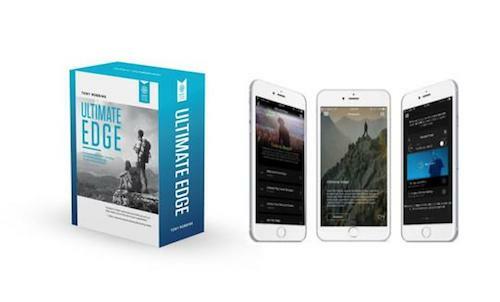 In this powerful 3-part Ultimate Edge audio program, Tony Robbins personally instructs you to connect with what you truly want most and how you can start to achieve it. Tony's life and career has been defined by an obsession with creating change and influencing massive action in people’s lives. With Tony Robbins’s Ultimate Edge, you will be able to learn and apply the strategies, tools and psychology to overcome your own challenges. And it’s designed in such a way that you can complete it in what we call “NET,” or “no-extra-time” — you can learn, grow, expand and improve while you driving, exercising or working at home. Now is the time to take your life to a new level. Say yes to your risk-free opportunity today and begin your journey to breaking through! An additional fee of $15.00 will apply for delivery to Hawaii, Alaska, Puerto Rico and Canada. We will be unable to accommodate deliveries to any other international destinations.